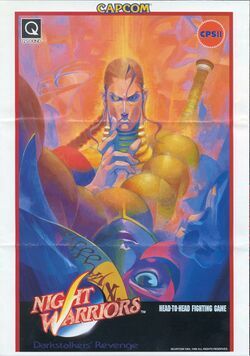 The second game in the series, fully titled Night Warriors: Darkstalkers' Revenge, and known as Vampire Hunter: Darkstalkers' Revenge (ヴァンパイア ハンタ, Banpaia Hantaa?) in Japan, was an upgraded version of the original Darkstalkers which introduced several gameplay changes to the game. The game introduced two new playable characters, Donovan Baine and Hsien-Ko, who were out to hunt the other Darkstalkers in the game (hence the Japanese title, Vampire Hunter). The two bosses from the first game, Huitzil and Pyron, were now playable characters as well. The main change in Night Warriors is the ability for the player to stock up on their special bars, allowing them to store more than one special bar and preserve them through the entire match. Two types of Super Moves are featured in the game: ES Specials, which requires a portion of the Special bar, and EX Specials, which require a complete Special bar to perform. Player can choose between a "Normal" gameplay style or one that offers Auto-Blocking. In Night Warriors, Pyron returns to add Earth to his collection. Enter the world's most fearsome monsters; ironically, the last defense of mankind. Meanwhile, two darkstalker hunters make their presence known and join in the fray. The game was ported to the Sega Saturn in 1996. This page was last edited on 13 April 2016, at 18:25.